Get immediate, actionable answers to complex questions with a simple conversation. Save valuable time. 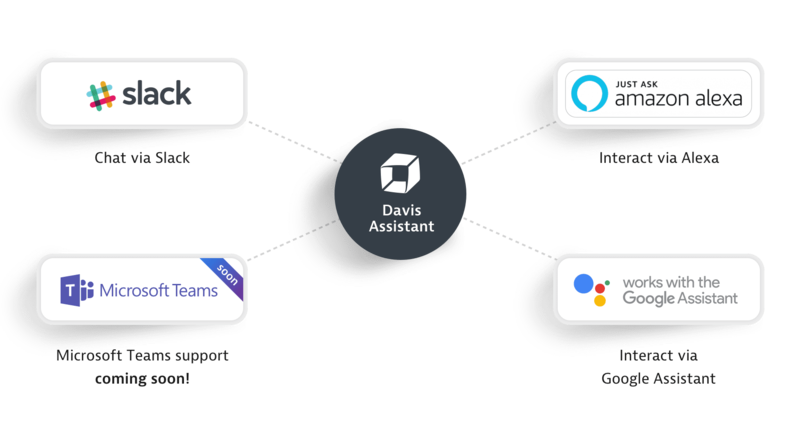 Boost adoption and collaboration with Davis Assistant. Get an overview of all open and closed problems that occurred during a specific time frame. Filter problems by application name and time frame. For complete root-cause analysis, drill down into individual problem details pages. 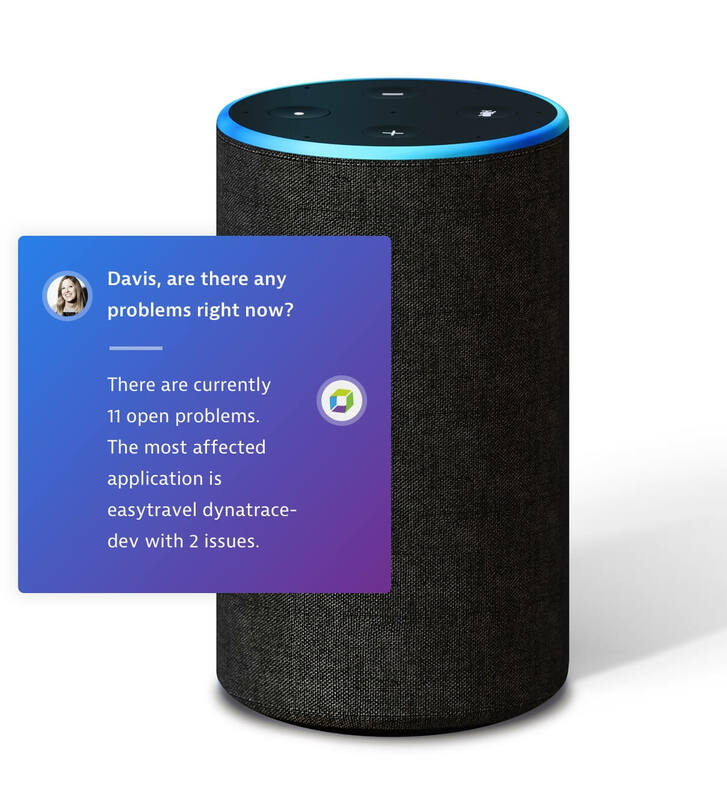 In addition to being accessible via any Alexa-compatible device, you can also chat with Davis Assistant via Slack, which makes it easy to share Dynatrace insights with team members. Davis, were there any problems over the weekend? 12 problems occurred over the weekend. Most of the problems occurred on Friday around 8:00 PM. Do you want to view a list? 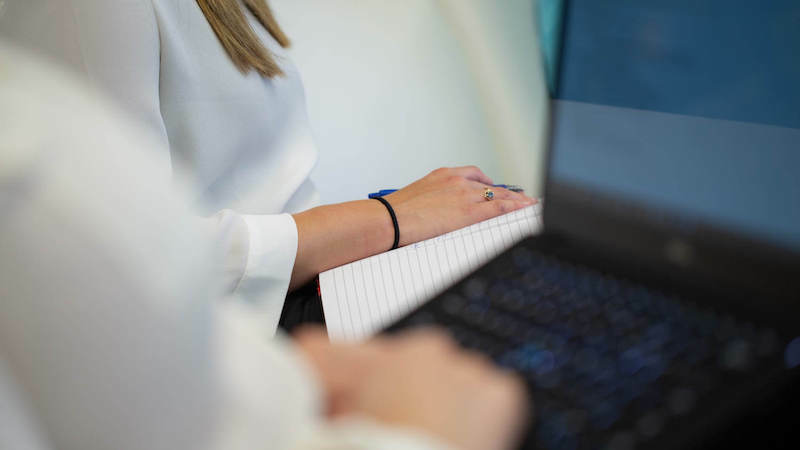 Get answers, not just more data, with an easily digestible morning report that provides relevant insights into system health, performance, and user activity. 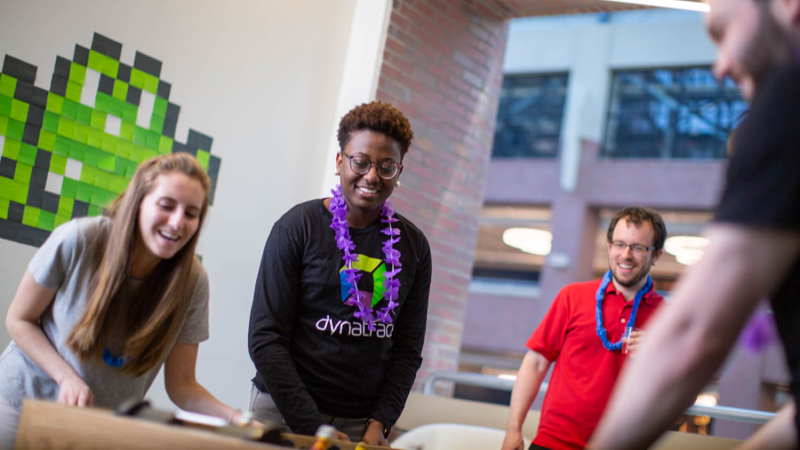 Tip: Read your daily report when you arrive in the morning and jumpstart your day with Dynatrace. Give me my morning report. Good morning. After analyzing 13 applications, here are some interesting findings from the last 24 hours. www.easytravel.com reports a 0.85 Apdex rating, a 49% increase over what was expected, and 7,200 sessions per minute, a 24% increase over what was expected. vmware.dynatrace.com reports a 0.97 Apdex rating, which is near the expected value 0.9. Know if your users are satisfied or frustrated with your application, or if any users were impacted by a specific problem. What was the customer experience over the weekend? Over the weekend, www.vmware.easytravel.com was the most heavily used application. The customer experience was excellent, with an average Apdex rating of 0.97. Get a user activity summary that highlights average user actions per minute. What was the most used application yesterday? Yesterday, your most used application was VMware easyTravel, which experienced an average of 265 user actions per minute. The highest load occurred yesterday at 7:10 PM when 230 user actions per minute were observed. Expect load to stay around 215 user actions per minute during the next 30 minutes. How do you want to communicate with Davis? 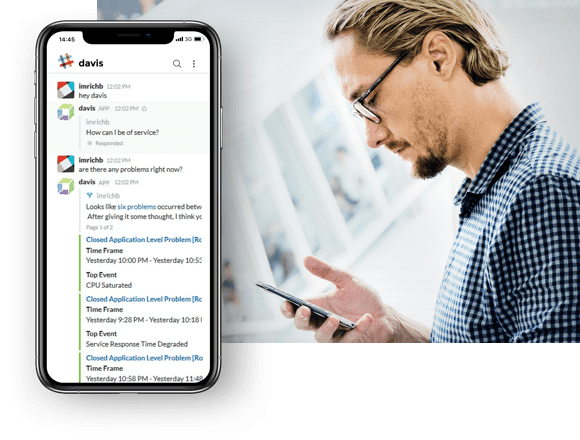 Explore the conversational interface of Davis Assistant, which makes your performance data accessible by answering your natural-language questions and displaying simple dialogs that extend the use of operational data beyond experts. 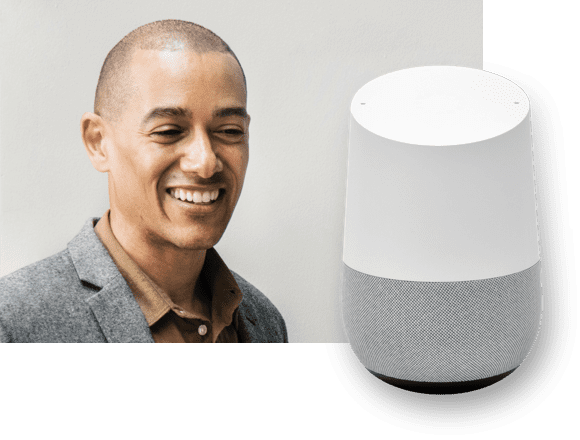 Davis Assistant provides executives with immediate, critical information. There&apos;s no need to log into Dynatrace. 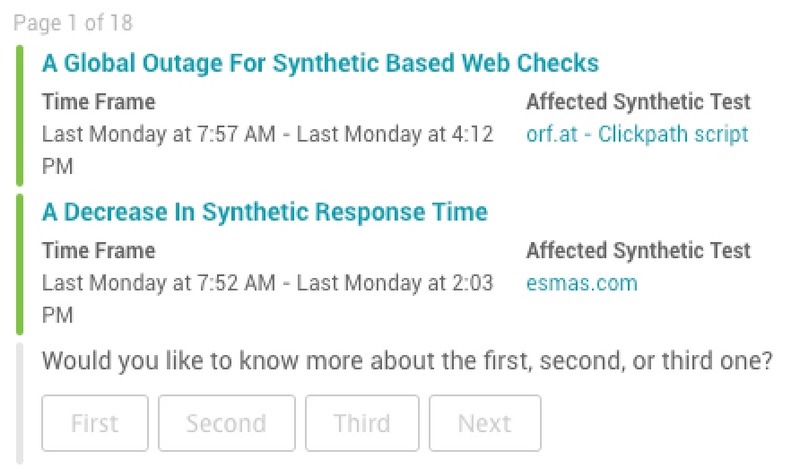 Minimize downtime by receiving problem notifications in Alexa and Slack that provide actionable insight into the health of your system. 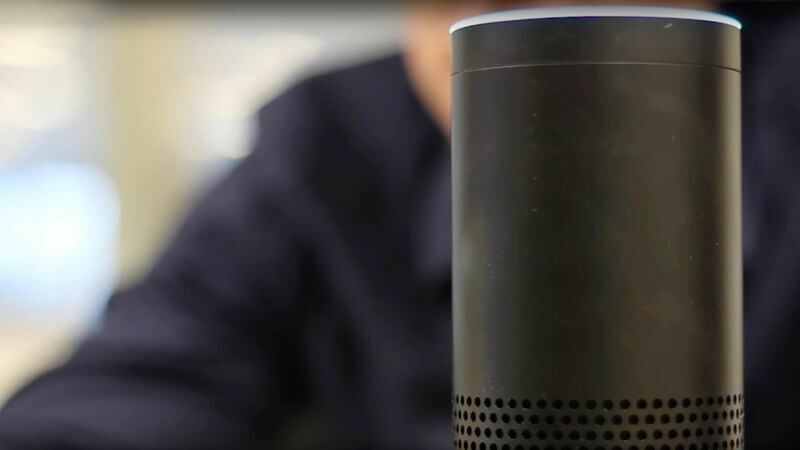 Ready to meet your virtual assistant? Get ready to be amazed in 5 minutes or less. or the Davis Assistant Slack app. No credit card is required for your 15-day free trial. You’ll be up and running in less than 5 minutes. 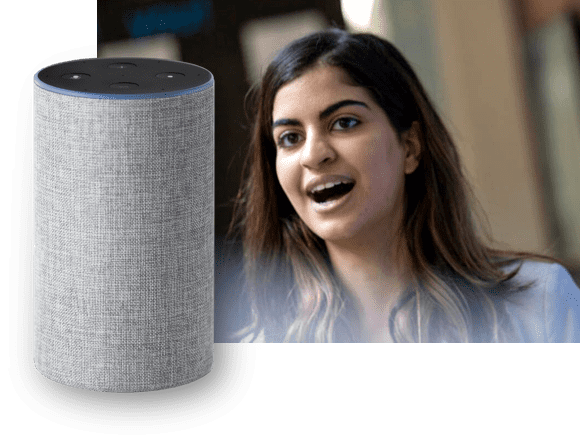 Get started with our Alexa skill or the Davis Slack app.